Retirement accounts have been in the news a lot recently. Recently, Frontline on PBS took a look at some of the retirement account flaws. Additionally, a new law recently went in effect requiring 401(k) plans to disclose all of their fees. The new statements are causing quite a flurry of interest in the ways that 401(k)s might not be the best retirement savings vehicles after all. Not starting early: You should start as early as you can. The longer you have to save, the larger your nest egg will be. Not contributing enough: “All too often,” Morningstar says, “[employees are] only contributing enough to get the employer match.” He recommends setting aside at least 10% of your income. Not having a simple diversified portfolio: Just investing in your company’s stock isn’t enough. Morningstar recommends sitting down with a fee-only advisor and working out a diversified plan. Selling when the market goes down: While it’s tempting to move your 401(k) assets into cash when the market drops, stay put. Panicking and selling at that time means you sell low — and buy high when the market starts recovering. Not working with an advisor when rolling over: If you change jobs, you will want to roll over your 401(k). Morningstar recommends working with a fee-only advisor as you decide what to do with your retirement money. Not rolling over the 401(k): “Leaving money in a 401(k) plan often costs the participant about 1% a year extra,” Morningstar says. Move your 401(k) when you move jobs. Roll it into your new employer’s 401(k), or open an IRA and roll it into that retirement account. Relying on target date funds: Morningstar points out that these are often funds of funds, and that they can come with fees that you don’t want to pay. Plus, in recent years, target date funds have been struggling. Failure to understand participant costs: You should know what, exactly, you are paying, since high fees can erode your earnings over time. Morningstar says that 1.5% is reasonable, but some plans go as high as 4% per year. Taking a distribution: Rather than rolling over, many plan participants take a distribution from the 401(k), cashing out. This can be a big no-no, since you will have to pay a 10% penalty to the IRS if you are under age 59 1/2. Plus, you will have to pay regular income taxes on the money. No idea of income replacement in retirement: “For people over 50, having no idea of what they will actually need for income replacement in retirement” is a problem, according to Morningstar. It’s vital to do some retirement planning ahead of time, and have a solid idea of what you need, and what your options are. 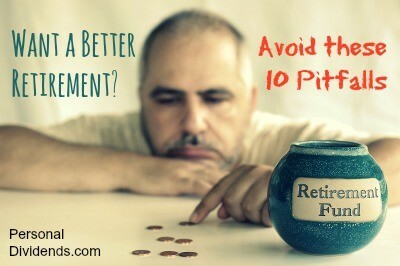 With the right planning, and a good approach, it’s possible for you to avoid these retirement pitfalls.